Red Tide algal blooms can pose serious environmental, economic & health risks. Understanding the causes of red tide blooms is a first and important step towards preventing the effects of these events from causing harm, and possibly someday being able to prevent them altogether. The phenomenon known locally as “Red Tide” is caused by an overgrowth of microscopic algae called dinoflagellates. Certain types of these dinoflagellates occur normally in low amounts in local waters. 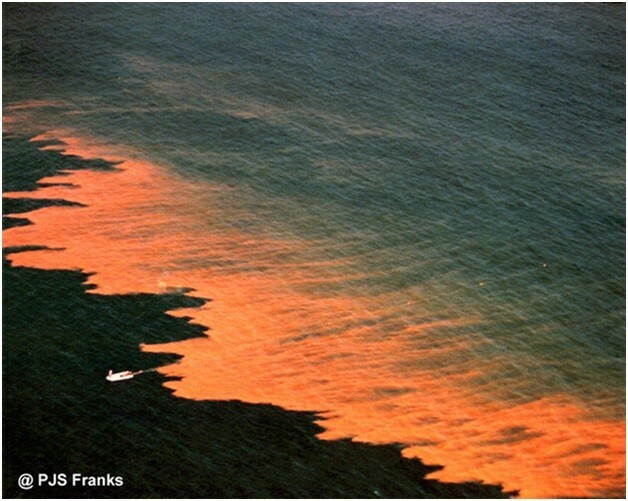 However, during harmful algal blooms such as Red Tide, they grow out of control. At these high levels, the chemicals produced by these microbes are toxic and even deadly to marine life such as fish, dolphins and manatees, and can cause health problems in humans such as eye and skin irritation and worsening of breathing conditions such as asthma. Aerial view of red tide affected waters.